Cold water or hot water high-pressure cleaning – which is right for you? Cold water high-pressure washers clean effectively thanks to the high impact pressure they provide. 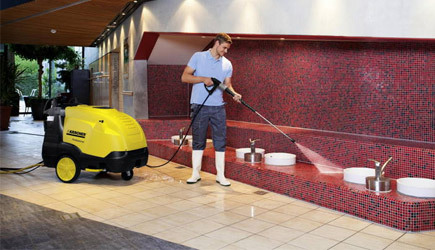 Machines with high water flow also help to flush away dirt and rinse quickly. With cold water machines, the temperature has no influence on the cleaning action. For removing stubborn dirt like oil and grease, cleaning results can be improved by using detergents. Hot water high-pressure washers increase the supplied water temperature to up to 80°C for general cleaning or up to 150°C for steam cleaning. This allows a reduction of the working pressure, cleaning time and the amount of detergent needed. Heat energy is an important factor in the cleaning process. The use of heat accelerates chemical processes; every 10 °C increase in temperature doubles the reaction speed. A 20 °C increase in temperature greatly increases the reaction speed. Oil, grease or soot are dislodged due to the heat and are easy to remove. The emulsion of oil and grease in water is accelerated. Finally, a heated surface dries faster. In practice, this means that higher water temperatures can reduce cleaning times by up to 40 % – with far better results. The cost of purchasing and maintaining a hot water pressure washer is generally higher due to the additional burner and related energy consumption. Using hot water offers a time saving of up to 40% with improved cleaning results. In addition, the HDS normally obviates the need for further detergent costs. 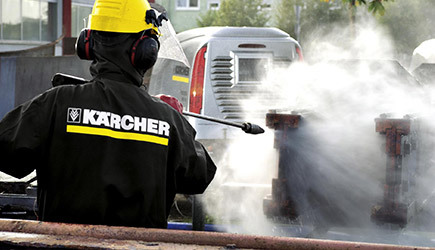 Since labour costs can be a multiple of the purchase and operating costs over the total lifecycle of the high-pressure washer, the use of HDS is often the more economical solution, depending on the type of application. HD – ideal for removing lightly adhering dirt and for cleaning large areas, e.g. dust, cement, moss and earth or protein-containing dirt.